Turn your kitchen trash into garden treasure. Given the right conditions, worms can accelerate the breakdown of rotting food and produce rich compost in return. Take one bin and drill a few drainage holes in the bottom of it as well as aeration holes along the sides near the top. Leave the other bin intact. Place a few spacers on the bottom of the intact bin. Place the bin with drilled holes inside the intact bin so it rests comfortably on the spacers inside the intact bin, but isn’t tightly nested. Fill the upper bin with enough dampened shredded paper to create a layer at the bottom 1-2 inch (3-5 cm) thick. Add a small amount of food scraps roughly equivalent to one eighth of the volume of paper in the bin. Let this mixture sit and rot for up to two weeks before adding your worms. When enough time has passed, add your worms. Over the next few weeks, mix from time to time with your hand and monitor for too much moisture. If there is liquid at the bottom of the bin, add dry, shredded paper. The mixture should feel like a damp sponge. When the food scraps have turned into brown compost, it’s time to harvest your compost! Pick out the worms and place them back in the bin to begin the process again with new food. You can keep this going for as long as you like, being careful not to add too much fresh food at once. The compost that your worms make is some of the best organic fertilizer available. Sprinkle anywhere in your garden for happy plants or give it to your favorite gardener for a happy friend. Composting worms eat the bacteria that feed on rotting food. They also eat some of the food and surrounding material to create a nutrient rich byproduct, called worm castings or vermicompost. By feeding worms your unwanted plant waste, you can generate quality compost for your garden with very little effort. 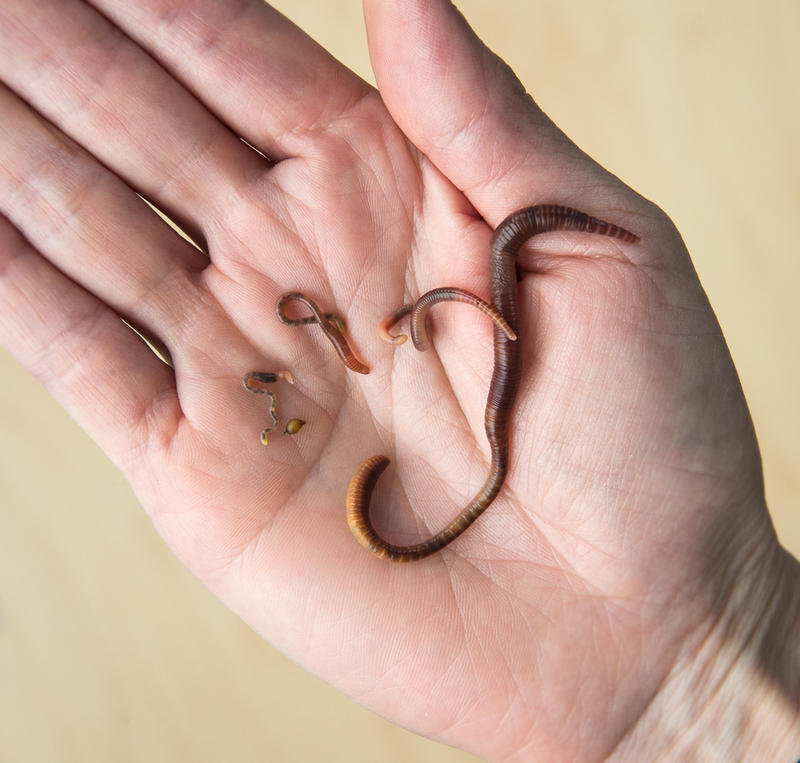 Here are some helpful tips if you want to continue propagating your worms. The primary cause of worm bin death is overfeeding. Take it easy on the fresh food, especially when your worms are first acclimating to their new bin. Think about the total volume that your worms take up. Start by adding half that amount of food. Anything you can eat, they can eat. Having said that, the more quickly something rots, the more easily your worms will process the food. Cutting vegetables into small pieces or freezing and then thawing will help hasten decomposition. Especially when your bin and population are small, you may want to avoid foods that are high in fat (like cheese), citrus, and meat. Always balance the food you add with some shredded paper. Quality compost needs an optimal ratio of carbon to nitrogen, and your food scraps are high in nitrogen. Add in whatever carbonaceous waste you generate, like soiled paper towels, cardboard tubes, newspaper, etc. If you are going away for a while, just feed your worms wet, shredded paper. They can exist on this for a long time. With a small bin, moisture control is your biggest concern. You want the environment close to what a damp sponge feels like. Worms take in oxygen through their skin, so the bin should not be overly wet, or it will become anaerobic. With a good feeding schedule, your worms will populate your bin at a density that makes them happy. If you want to keep expanding your horde, you can stack an additional bin above your current one or make a completely new bin. If you have as many worms as you want, they make great gifts. If your bin smells, something is wrong. The conditions in your worm bin have turned hospitable for anaerobic bacteria. If too wet, add some dry paper. If too much food, remove some. If too compacted, mix everything around to introduce some oxygen. If your worms are wandering up the edges and to the lid of the bin, they must not like their home. Is it too wet or dry? If you are just starting your bin, shine a light on the outside. The worms will prefer the dark bin you have set up for them. You may find over time that your bin has unwanted guests, like mites, potworms, or millipedes. For the most part, these are harmless and just aiding in decomposition. If they really bother you, keep your bin on the drier side. There are numerous books and web resources about worm composting. The classic introductory book is Worms Eat My Garbage by Mary Appelhof.